I have a number of Joomla 3.x sites, which I want to manage centrally, however they are all for different clients, so I cannot share any information between them. What I want to achieve is to automate updates between them, run them at different versions (mainly to reduce upgrade risks) and be able to install extensions to multiple sites. What I have done so far is set up a subversion repository with the shared code and I link this into each site with svn externals. However I have not achieved automation between the databases, in terms of structure of the database and updating the details of extensions. My installation runs on my own dedicated server, which is locked down, so I have to change access rights of folders every time I upgrade Joomla or an extension. I have at times upgraded Joomla by running the SQL scripts that come with the upgrades myself, at other times I have taken the change access rights/ upgrade/ change access rights route. Both approaches are still quite tedious. I had a cursory look a these extensions: http://extensions.joomla.org/extensions/core-enhancements/multiple-sites but none of them look like they may do what I want. Has anyone done anything in this area and could give me some pointers to build a system myself? - are there code libraries (outside Joomla) that can track the changes to extension and other tables? My list of extensions is likely to stay restricted, I tend to code anything else that is needed in the templates or plugins. - any other ideas? 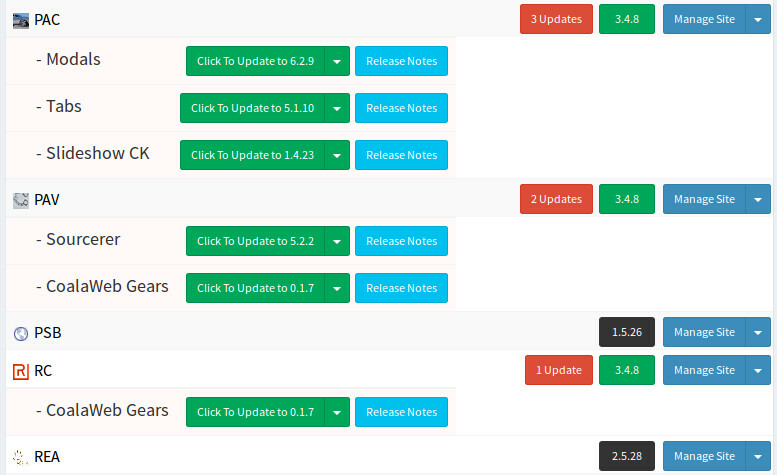 New features are regularly being implemented. You might also consider watchful.li which has similar functionality and seems to be more affordable up to 25 websites. For more than 25 websites, the myjoomla.com unlimited sites option may be better value. Switch the working directory version to the new database. This reduces the risks to a minimum and the downtime to zero if you make the last two steps atomic (really fast). I don't suppose you've looked at Watchful.li yet? We manage 200+ sites on a regular basis with extension and joomla updates. Watchful is designed to help manage this exact scenario pretty well. It's a newer service and they're regularly adding new features. Now a potential drawback I see is that if you're interested in giving clients access to their own closed-off part of this control panel I don't see that being possible yet, but it'd be a good feature to ask them about implementing. We are in the process of putting about 200 sites on this solution. We have about 50 currently and we're moving more over as we're able. I'm expecting to reduce a lot of our staff time by moving over to Watchful and increase productivity as a result. Not the answer you're looking for? Browse other questions tagged joomla-3.x update upgrade or ask your own question. It is safe to allow access to Joomla default Administrator user-group?